At IWCO Direct we tend to avoid the spotlight. We’ve established a culture of staying focused, working as a team to be as efficient as possible and doing great work for our clients. Receiving kudos from a client on a project well-done (and earning the trust they place in us to help grow their business) is our greatest reward. However, we did receive some nice coverage in important industry publications this month that is worth celebrating. IWCO Direct was the cover story in the March issue of Printing Impressions. The feature story describes how our creative strategy, total package solution and enhanced postage strategy is driving measurable results for our clients. And talk about perfect delivery — the March issue was released just in time to be distributed at the National Postal Forum! If you subscribe to Direct Marketing News, hopefully you read the Essential Guide to Direct Mail Marketing supplement. In an article entitled, Stamping Out “Or Current Resident,” Debora Haskel, our VP Marketing, provided readers with keen insight regarding how digital printing advancements are enabling greater levels of direct mail personalization. She also defined the difference between personalization and relevance, with relevant content being the key to increase direct mail open and response rates. A few pages later, Mike Ertel, EVP Sales and Marketing, was one of the direct mail experts invited to weigh in on the myths and realities of direct mail. Mike debunked the idea that direct mail costs too much by explaining that due to its high response rate and return on marketing investment, direct mail remains extremely cost-effective. Both articles are free to access, but you may need to register. 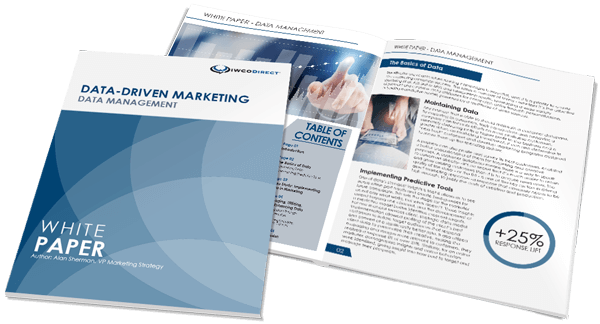 You can also download a complete copy of the Essential Guide to Direct Mail Marketing. Thanks to everyone at IWCO Direct for the great work that makes this type of recognition possible.